Industry groups such as the Washington-based Nuclear Energy Institute have said the loan guarantees are critical to reviving the industry because most companies can’t afford the capital investment in a facility that can take a decade to complete. The institute in a December report put the cost of a reactor at as much as $9 billion. Now, this argument tends to go round and round—see here for a recent roundtable with a variety of views on the subject—although do note that it would help if we had a price on carbon and could lean more heavily on the market, rather than federal subsidies, to sort out these disputes. But that option's bogged down in Congress right now. 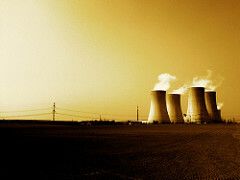 Meanwhile, costs aren't the only hold-up with nuclear power. There's also the waste question, especially now that Yucca Mountain's been nixed. But it seems like the government's creeping forward on that, too: On Friday, the Energy Department announced a new commission to study waste disposal. They even got the ubiquitous Lee Hamilton to head the thing (you might remember him from his stints on the 9/11 Commission and the Iraq Study Group, among other blue-ribbon specials). It's not clear that yet another commission can resolve a volatile issue like how we should handle our radioactive waste, but it's a first step, at least.